Modern buildings conceal the vast majority of the plumbing pipes within the walls for aesthetic reasons. Unfortunately, this can make detecting leaks extremely difficult. As a property manager, you need to be able to quickly detect and stop hidden water pipe leakage in order to avoid costly water damage and high water bills. Small leaks behind walls may not leave many signs. However, if you pay attention to your building’s water bills and remind your maintenance team to be on the lookout for the signs of a plumbing leak, you should be able to detect the problem and call a qualified plumbing technician before any serious damage has occurred. The wallpaper or paint is peeling or blistering. You see evidence of black mold or black spots. You see water spots in areas that should be dry.You smell a musty or wet smell in a particular area. Your water bill has suddenly increased to spite no identifiable rise in daily water usage. As soon as you or your maintenance team realizes you have a water leak, you should take steps to turn off the water in that area to prevent further water damage and call a professional. 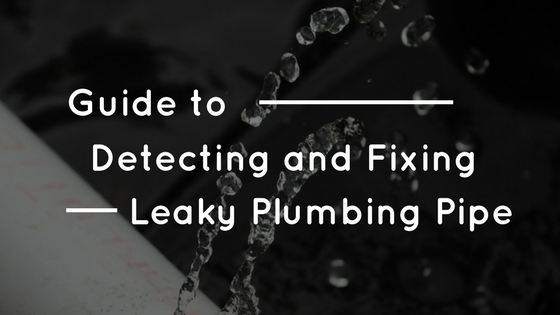 However, if you wish to confirm the leak before calling a plumber, there are things you can do. Make sure that every water fixture, faucet and water using appliance is off. Locate your building’s water meter and write down the numbers and/or note the position of the needle. Leave the water fixtures, faucets and appliances off for a period of time, eight hours if possible. After the elapsed time, note if the needle has moved or if the numbers have risen. If either of these things has occurred, you may have a water leak. If you, your property management team or maintenance personnel have noticed any water spots or moisture along a wall, touch it to confirm the presence of water. All inside walls should be dry. Press on the area of the wall where you suspect the water leak is located. If it feels spongy, there’s a strong likelihood that there is a leak behind the wall. Calling a professional plumber and scheduling a plumbing inspection and water leak repair service is the best way to locate and stop water leaks. Plumbing inspections can include a water pressure test and/or a camera inspection. A pressure test involves turning off the water to the building. Then, an air host is connected to the plumbing system and turn on. This allows pressurized air to fill the pipes to a specific PSI. If the pipes fail to hold the desired pressure, there is a leak in the system. A camera inspection also involves turning off the water. For this test, a small camera on flexible tubing is threaded through the water pipes. The camera then displays the images on an LCD screen and records the inspection. If high levels of corrosion are detected or there are obvious breaks or flaws in the pipes, it can indicate the presence of a water leak. If you do not have any visible damage on your floors, ceiling or walls, you may be a good candidate for trenchless pipe restoration, which involves repairing your pipes without tearing out large sections of drywall. 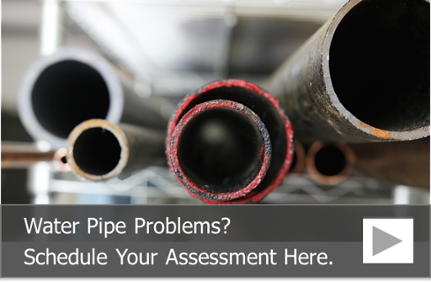 Restoring your pipes trenchlessly starts with a plumbing pipe camera inspection. If your pipes can be repaired with our epoxy pipe lining technology, they are thoroughly cleaned and dried in order to prepare them for the installation of a pipe liner or an epoxy coating. Pipe liners are used on drain lines in order to seal leaks and restore the durability of the pipe. Epoxy coatings are used on water supply pipes to seal pinhole leaks and stop further corrosion. To learn more about trenchlessly repairing water pipe leakage and to schedule a building pipe assessment, call us at 815-790-9000.